After HP upped the ante by $500 million, all eyes turned to Dell in the surprise bidding war for cloud storage firm 3PAR. With both tech giants looking to continue the aggressive expansion of their respective enterprise services divisions, an acquisition like 3PAR would add significant assets to their portfolios. Alas, for HP there were not wedding bells to be heard, as Dell would have nothing of this raised bid and submitted a counter-offer to top HP’s. From the looks of things, that’s good enough for 3PAR, as the 3PAR board has formally accepted Dell’s $1.52 billion bid. Granted, Dell didn’t raise the stakes as much as HP did during the last round, but $1.52 billion is more cash than $1.5 billion, and in this game more dollars wins. To sooth the sting of the love lost, HP instead announced that they were buying Denver-based database and application automation company Stratavia for an undisclosed wad of cash. Stratavia will become part of HP’s Software and Solutions division and will help the company improve their time-to-market for software systems development. The company’s assets will also be leverage to enhance HP’s cloud computing and storage systems, with Stratavia’s database and application packaging automation solutions serving to accelerate delivery to customers. Alas, ‘tis better to have loved and lost, than never to have loved at all. Source: New York Times, MarketWatch; Thanks to everybody that sent this in! 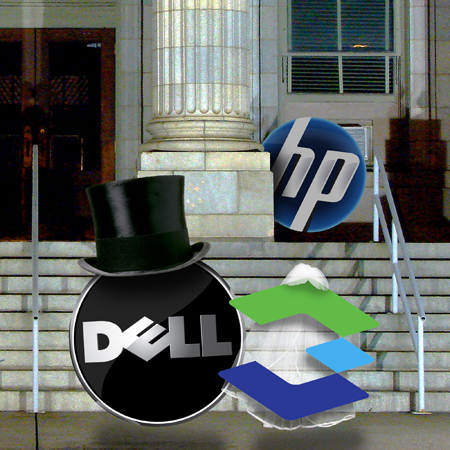 Update 2: Dell went ahead and matched HP's offer and 3Par accepted. No word if HP will try to jump in again. Thanks to everybody who sent this in! Update 3: ...and HP has re-upped their bid again, this time to $30 per share, or $2 billion. Gotta say, we're with @foxycar on this one.